Exciting new range from Ulster Carpets is now available at Buckley for Flooring! In recent years the demand for loop products has grown considerably given the durability and contemporary look it creates. Ulster Carpets have combined this demand with the current trend for the quiet, understated aesthetic found in Danish design to create their latest loop collection, HΛBITÜS. Drawing on the emotional connection we create with the surrounding elements, HΛBITÜS blends contemporary patterns and comforting textures with neutral colourways and contains four designs, Urban, Rustik, Croft and Strönd. Ulster are excited to have now launched the first of the HΛBITÜS range… Croft! 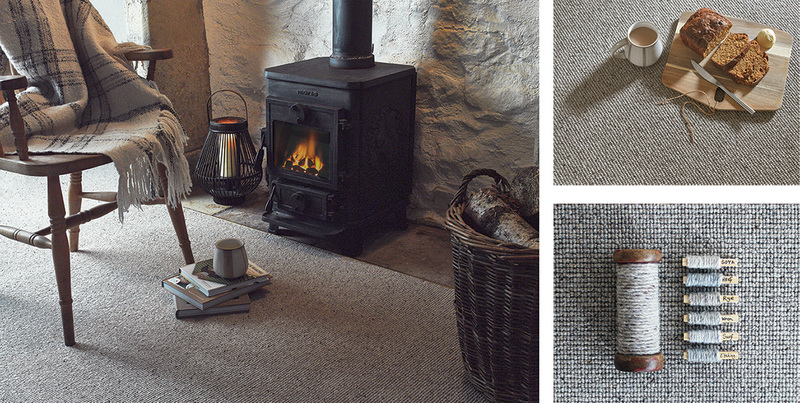 It features six berber shades Soya, Rye, Surf, Reef, Wren and Etching which have been manufactured using a combination of plain and heathered yarn, creating a natural textured finish and an organic ‘artisan’ feel. The View Collection exudes warmth and cosiness, with soft, blended colouring. Surf and Reef have subtle blue undertones; Etching combines grey and charcoals, whilst Soya, Rye and Wren are blends of neutrals which bring to mind the warmth of natural fleece. Keeping in line with current interior trends, Croft reflects the ‘Hygge’ movement of cosiness and comfort and conjures images of log fires, chunky knit throws and hand crafted textiles. 100% British & NZ Wool using 3 ply yarn for optimum performance Available in five colour matching multi-widths (5, 4, 3, 2 and 1m) Unique ultra-light action back, this will not delaminate and is almost impossible to crease. Manufactured in Denmark by danfloor (an Ulster Group Company specialising in the manufacture of loop products) HΛBITÜS sits alongside Ulster’s popular Øpen Spaces range, sharing the same naturalistic composition of 100% wool and the durable yet tactile look it creates. For more information contact your local Ulster representative. Axminster Carpets wins Best Residential Carpet of the Year!